Adrenal Health Part One: Shrug off fatigue and get your life back! Whether it is financial, emotional or physiological stress; high levels or long-term stress is detrimental to our health. Add to the equation the feeling of needing a break and often there is not enough time in the day, it is no wonder that many New Zealanders are suffering from Adrenal Fatigue. Stress depletes our adrenals; it can decrease our ability to deal with each day, and can leave us feeling helpless. If this sounds familiar, it is important to remember that you are not alone; anyone can suffer from adrenal fatigue. To increase your ability to deal with stress and reduce the impact it has on your adrenals, first it is important to understand Adrenal health. Adrenal fatigue is the result of prolonged stress, resulting in the reduced function of the adrenal glands. Vital to our health and wellbeing, the adrenal glands are located just above the kidneys where they have a huge impact on kidney function as well as hormone production. The body needs hormones such as adrenaline and cortisol to function optimally, however in times of stress they are produced in great amounts. Over time prolonged stress can lead to reduced hormone production as the adrenal glands tire from the constant over production of these hormones and as other body systems attempt to compensate. Our bodies are not designed to withstand long-term stress and although many of us may tolerate it, eventually our adrenals become fatigued. During times of stress, a series of chemical reactions and physical responses take place. Stress activates the sympathetic nervous system and the brain sends a message to the adrenal glands to increase production of hormones such as adrenaline and cortisol, activating the fight-or-flight response. Our awareness is increased, digestion slows and blood and oxygen is diverted to the brain, heart, lungs and other large muscles, in preparation to run as we would have historically from perceived danger. The same nutrient rich blood and oxygen is taken away from ‘non-essential’ areas such as the reproductive system, digestive tract, and our skin during this time; a constant state of fight-or-flight may therefore have an adverse impact on our long-term health. Adrenalin (epinephrine) is our short-term stress hormone; if adrenaline is high, you are likely to be startled when somebody suddenly appears in the room. Produced during perceived danger, adrenaline activates the fight-or-flight response. As adrenaline is released, the blood supply is diverted and blood sugar rises as our bodies perceive an increased need for energy. Subsequently insulin is elevated to control the rise in blood sugar. Insulin is our primary fat storage hormone and often contributes to weight gain seen in times of stress. If insulin release is being constantly stimulated in response to cortisol, fat storage can increase due to the constant interaction between these two hormones. Cortisol is our long-term stress hormone. In optimal amounts, it controls inflammation, regulates blood pressure, controls our sleep/wake cycle and helps us to bounce out of bed. Cortisol should be high in the morning, however for those suffering from adrenal fatigue, low morning cortisol will make it hard to get out of bed. As cortisol levels naturally decrease during the day, by mid-afternoon levels will be extremely low. In adrenal fatigue it is not uncommon for cortisol to peak at night making it hard to relax or go to sleep. Cortisol increases glucose production, buffers the effects of insulin and assists in protein and fat metabolism. In reduced amounts however low cortisol will have you reaching for a quick-energy fix, to try to help maintain your fading energy levels. Swap your morning coffee for an anti-inflammatory turmeric latte or calming chamomile tea, often we don’t need a coffee, just a moment to ourselves. Regarded as one of the holiest plants within Ayuvedic Medicine, Holy Basil is considered an elixir of life. Unique for its variety of actions, it is traditionally used to deal with the stressors of daily life and promote health and wellbeing. 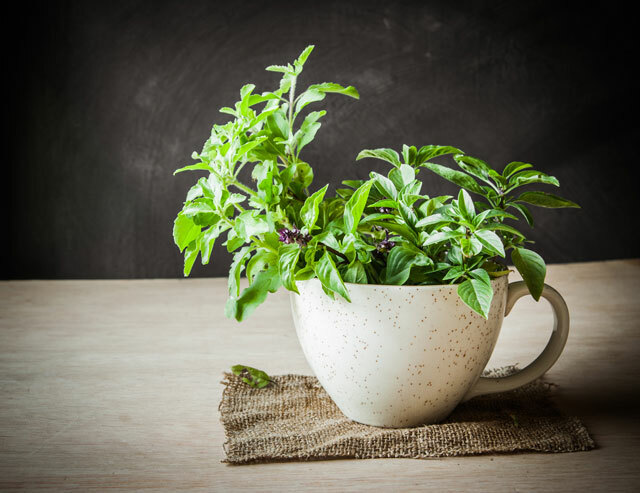 Holy Basil is a potent adaptogen, anti-oxidant and anti-inflammatory which helps the mind and body to adapt to a range of physical, emotional and chemical stressors. Used in Ayuvedic medicine to promote physical and mental health, Ashwagandha is antioxidant, anti-inflammatory, anxiolytic and anti-depressant in nature. Traditionally used as an adaptogen, ashwagandha improves the body’s ability to adapt to varying situations, may improve and support the liver function, and help ease the negative effects of chronic stress including hyperglycaemia, forgetfulness, depression and elevated cortisol. Used in Traditional Chinese Medicine since 190AD, Siberian Ginseng supports chronic exposure to stress, with specific adaptogen activity on the adrenal glands. Siberian ginseng alters hormone and neurotransmitter levels to reduce the risk of depleted adrenal glands and subsequent exhaustion. Clinical trials have found Siberian ginseng has the unique ability to reduce cortisol levels when elevated and raise them when they are low. Considered among the most important Traditional Chinese Medicines, Astralagus is widely used to enhance vital energy, reduce fatigue and promote health. Best known as an adaptogen; Astralagus is commonly used in chronic conditions of adrenal fatigue; astralagus improves endurance, and supports the body’s ability to deal with physical, emotional or environmental change. Tibetan medicine regards Cordyceps mushroom as a tonic for all illness; due to its profound effect on improving stamina and endurance. An adaptogen, anti-inflammatory, and immune system regulator, Traditional Chinese Medicine also used Codyceps to nourish the kidneys. Codyceps help to produce and balance cortisol, and replenish the adrenal glands, and balances the hormonal cascade which leads to the release of cortisol by the adrenal glands, therefore reducing prolonged stress. Everyone deals with stress differently and many people have high levels of stress for years without realising the impact it is having on their health. The body is not designed to cope with long term stress and it is important to support your adrenal glands in order to help your body cope and reduce the impact on your adrenal glands. If you suspect you are suffering from adrenal fatigue, take Dr. Wilson’s Questionnaire for more information and keep an eye out for the next blog on how to support your adrenal glands for a better night’s sleep.